In my earlier ‘Waste of Space‘ post I described my plans for a previously unused area beside the house. 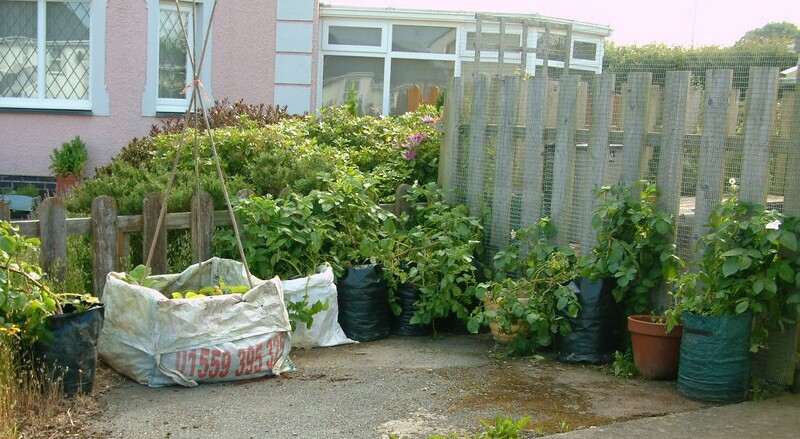 The first stage was just to get something in the area and I started by placing some potatoes along the fence in bags. These have grown like mad, but the rain and strong winds last Friday rather battered them – being raised above the ground they are more exposed than plants growing directly in the soil. However, they weren’t completely destroyed and so should still be producing tubers down in the compost. But potatoes were only the beginning. 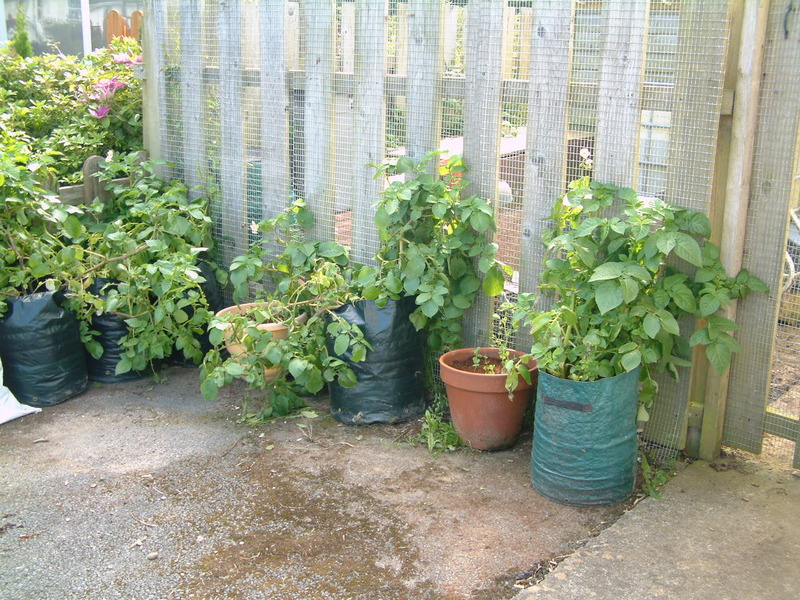 The next addition was two large pots of mangetout to grow up the fence. This fence has had to be covered with mesh and the height increased because of escaping chickens that would get over the top (via the compost bins) in order to visit the neighbours or take a stroll down the street. Sadly our greatest escapee, Gytha, died yesterday, but the mesh has to stay as the others are not entirely trustworthy. So, tall pea plants seemed a good way to mask the mesh and make use of vertical space that was just begging to be utilised. The plants were started in the greenhouse where some of them were eaten by a mouse; however, some survived and are now a few inches tall… fingers crossed they will produce some pods. My latest addition to the area is a ‘dumpy bag’ filled with compost from my big green cone compost bin and planted with the ‘three sisters’. For those of you who don’t know, a dumpy bag is one of those cubic metre sacks that building materials arrive in. The builders merchants won’t take them back for reuse (in case they fail, I guess) and so they are generally regarded as rubbish. We have several of them and I’ve heard of them being used elsewhere for planting so thought I would give it a go once I had enough compost to fill one. Mostly from waste: a dumpy bag filled with grass clippings, cardboard and home-made compost. As for the ‘three sisters‘, they are squash, corn and beans, which grow well together as a ‘guild’. In theory, the corn should provide support for the beans, but I know that corn is a tricky crop here in west Wales, so I have added some canes for the beans. 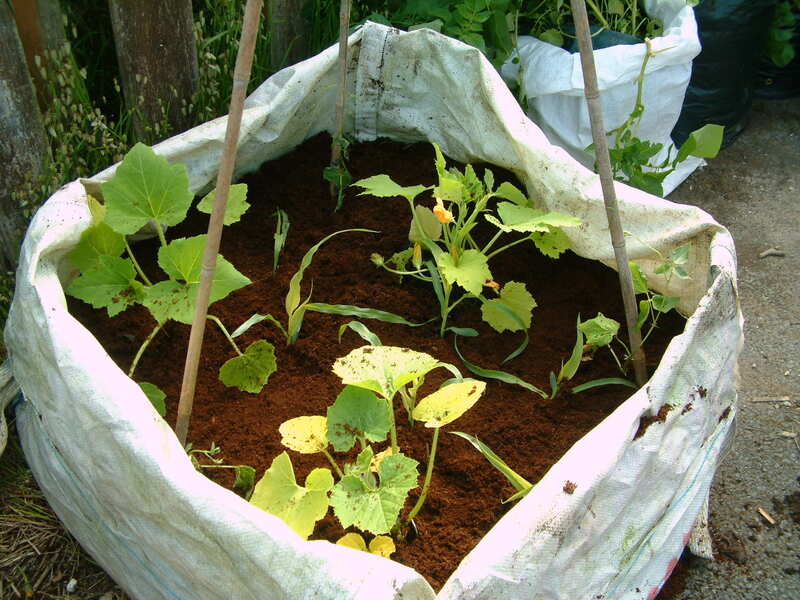 My planting is very dense, but since the bag contains compost with a cardboard-grass clippings-cardboard sandwich in the base (to hold moisture and provide heat as it breaks down) there should be plenty of nutrients and the beans should fix nitrogen to further boost the fertility. I did cover the top of the home-made compost with about an inch of coir fibre with no added nutrients to serve as a mulch and discourage weed growth from the compost until the squash leaves get big enough to suppress any weeds on their own. I only had three runner bean plants left from my earlier garden planting and these are looking the worse for wear, but I’m hoping that they will perk up now they are in such a great growing medium. I planted three different squashes: Boston (a winter squash), summer crookneck and a courgette (zucchini)… any rampant rambling can be across the tarmac or along the little fence. This is a real experiment for me, but I think that it might be quite successful. Some ingenious ideas for using difficult spaces and odd materials – thanks! Always looking for ways to use things that other people consider to be ‘rubbish’… I’m currently looking out for an old panel from the side of a bath to use as a roof for our chicken house! The corn is invariably the weak link in three sisters plantings in the UK in my experience. Most beans will easily outgrow it in an average to poor summer. Perhaps Carol (Resilient Gardener) Deppe’s corns would be more suitable if you can get hold of those at some stage. I’m intending (one day) to try using talet (Amphicarpaea bracteata) as the legume in a three sisters planting. It grows well in our climate and is much smaller with subterranean beans. It is grown in the milpas of Southern Mexico along with the corn. Good luck! Thanks for the suggestions. Every year I grow a little corn… currently ‘Double standard’ from the Real Seed Catalogue. I reckon that I get useable cobs about one in three years… not great but worth a gamble.